610.027. Violations — remedies, procedure, penalty, purposeful violations — validity of actions by governing bodies in violation — governmental bodies may seek interpretation of law, attorney general to provide. — 1. The remedies provided by this section against public governmental bodies shall be in addition to those provided by any other provision of law. Any aggrieved person, taxpayer to, or citizen of, this state, or the attorney general or prosecuting attorney, may seek judicial enforcement of the requirements of sections 610.010 to 610.026. Suits to enforce sections 610.010 to 610.026 shall be brought in the circuit court for the county in which the public governmental body has its principal place of business. Upon service of a summons, petition, complaint, counterclaim, or cross-claim in a civil action brought to enforce the provisions of sections 610.010 to 610.026, the custodian of the public record that is the subject matter of such civil action shall not transfer custody, alter, destroy, or otherwise dispose of the public record sought to be inspected and examined, notwithstanding the applicability of an exemption pursuant to section 610.021 or the assertion that the requested record is not a public record until the court directs otherwise. 6. A public governmental body which is in doubt about the legality of closing a particular meeting, record or vote may bring suit at the expense of that public governmental body in the circuit court of the county of the public governmental body’s principal place of business to ascertain the propriety of any such action, or seek a formal opinion of the attorney general or an attorney for the governmental body. Attorney General Josh Hawley (r), also a candidate for the U.S. Senate, has appeared to be a reluctant participant in holding (now) former Governor Eric Greitens (r) accountable for his and his staff’s use of a self deleting texting application to conduct state business. A private attorney filed a lawsuit under the Missouri Sunshine Law (RsMO 610) to shed more light on this practice in the governor’s office. Today it was revealed that twenty individuals (including Eric Greitens) in the governor’s office had the application on their phones, not eight as reported in Attorney General Josh Hawley’s earlier assertions. 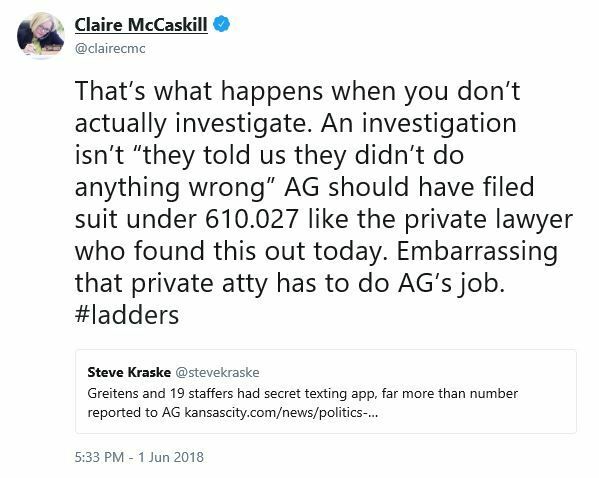 The Attorney General’s reticence on the subject became a social media bludgeon today, wielded by Senator Claire McCaskill (D). That statute SPECIFICALLY gives the Attorney General the right to bring suit but he refused and this private citizen is doing his job for him. Not good. Totally bogus excuse that he couldn’t subpoena. He could have done exactly what this private attorney did and gotten the information he claims he couldn’t get. The subpoena excuse is close to the dog ate my homework. Totally bogus. Does the AG’s office expect people to believe that a private lawyer has more power than the Atty General? Embarrassing. That left more than a few marks. And it’s just the beginning of June.